Making a good pizza at home can be challenging. The main reason for this is that our home ovens are unable to reach the high temperatures of commerical pizza ovens, which makes it difficult to produce a pizza with a brown and crisp top and bottom crust. But there is a way to simulate a pizza oven at home that will give you excellent results. So good in fact, that you may not want to ever buy a pizza again. But first, we need to talk about the pizza dough. Over the years I've experimented with a lot of different doughs. My favorite is Jim Lahey's "No Knead" pizza dough. 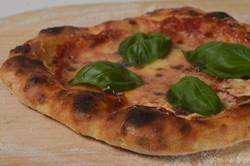 This recipe is one I adapted from his book "My Pizza". I really like his book as it's full of information on ingredients, techniques, equipment and, of course, recipes on how to make a really good pizza at home. The thing about this "no knead" dough is that it's so easy to make. All you do is mix the ingredients together and then let the dough sit (ferment) at room temperature until it has more than doubled in size and has lots of air bubbles (this can take anywhere from 14 to 16 hours depending on the room temperature of your kitchen). I love that you can use the pizza dough straight away or it can be covered and stored in the refrigerator for about three days. So this is a great 'do ahead' recipe. I often make the dough on the weekend so we can have homemade pizzas during the work week. Now, for baking the pizza this is how I do it. I put a pizza stone on my oven rack that is placed 8 inches (20 cm) from the top Broiler ('Broiler' is the North American term for the 'top heating element'). Then I preheat my oven to its highest temperature (500 - 550 F or 260 - 290 C). Do this about 45 minutes before you want to bake your pizza as you really want to heat up the pizza stone. (This is how you get a golden brown bottom crust.) After about 45 minutes turn your oven setting to Broil (that is, turn on your top heating element) for about 5 to 10 minutes. This step will heat up the pizza stone even more. Now, check your oven's manual on how to do the Broil. Because with some electric ovens you may have to first open your oven door for 10 - 20 seconds to release some of the heat before the Broiler will turn on. Finally, when you bake your pizza keep the Broiler (top heating element) turned on as this will ensure that the top pizza crust becomes brown and crisp, with a filling that is nice and bubbly. Then lightly oil a large bowl. Place the dough into the bowl and then flip it over so the top of the dough has a light coating of oil. Cover with plastic wrap and let it sit (ferment/ proof) at room temperature (about 72 degrees F (22 degrees C)) for about 14 to 16 hours (the time will depend on your room temperature - the cooler the room the longer it will take) or until the dough has more than doubled in size and the top of the dough has air bubbles. Next, turn out your dough onto a lightly floured surface. You want the top of the dough to now be on the bottom. Lightly flour the top of your dough and divide into four equal sized pieces (about 215 grams each). When you divide the dough use a bench scraper or knife to cut the dough (try not to pull or stretch the dough). Then, working with one piece of dough at a time, gently flatten into a 4 inch (10 cm) round. Then take the edges of the dough and fold them into the center and gently seal. Flip the dough over so the smooth side is facing up. With the palm of your hand gently rotate the ball of dough on your counter to create surface tension and to seal the edges of the dough completely. If the rounds of dough are sticky, lightly dust with flour. Cover with plastic wrap while you preheat your oven. If not using the dough right away, wrap each round in plastic wrap and refrigerate for up to three days. Bring the dough to room temperature before using (this will take about 1 - 2 hours). The dough can also be frozen. Defrost in the refrigerator overnight. At least 45 minutes before baking your pizza, preheat your oven to 500 or 550 degrees F (260 - 290 degrees C), or to the highest temperature your oven will go to. Put a pizza stone on your oven rack that has been placed about 8 inches (20 cm) from the top Broiler (top heating element). After 45 minutes, switch the oven setting to Broil (turn on the top heating element) for 10 minutes (this will really heat up the pizza stone and ensure that the pizza dough browns on top). Have ready a pizza peel (or the back of a baking sheet) that has been generously sprinkled with flour or fine cornmeal. Working with one round of dough at a time, place on a well floured surface. Using your fingertips, gently press the ball of dough into a round flat disk. Then with your floured fingertips and knuckles, gently stretch the dough into a 10 inch (25 cm) round. Another way is to pick up the round flat disk of dough and place your floured knuckles at the edges of the dough. Rotate the dough, using your knuckles, letting gravity stretch the dough downward until you have a 10 inch (25 cm) round (see video). Try not to handle the dough too much as you want air bubbles in the dough. Gently place the dough on the floured pizza peel. Spread about 1/4 cup (60 grams) of tomato sauce over the dough, leaving about a one inch (2.5 cm) border with no sauce. If you like you can brush the edges of the dough with olive oil. Evenly scatter (about 2 1/2 ounces or 75 grams) large pieces of mozzarella cheese on the tomato sauce. Gently shake your pizza peel back and forth to make sure the pizza isn't sticking to the peel. Then with a quick jerking motion transfer the pizza onto the hot pizza stone. With the oven setting still on Broil (top heating element turned on) cook the pizza for about 5 - 7 minutes or until the top is bubbling and the edges of the pizza are nicely browned, but not burnt. Using your pizza peel, remove the pizza from the oven and place on your serving platter. Sprinkle the top of the pizza with some grated parmesan and a small handful of fresh basil. Then, using a pizza cutter or sharp knife, cut into slices. Serve right away. Tomato Sauce: Place the crushed tomatoes in a container. Add the red wine vinegar, salt and pepper, sugar, and crushed red pepper flakes. Can add some finely chopped garlic and/or fresh or dried herbs to taste. The sauce can be covered and stored in the refrigerator for about a one week or frozen for a couple of months. Makes 4 - 10 inch (25 cm) pizzas.